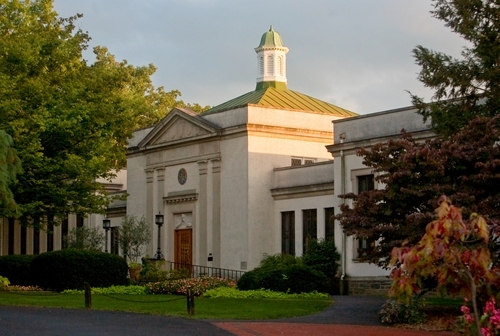 In 1924, the school’s trustees built the Joseph Krauskopf Memorial Library. They felt no finer tribute could be paid to the memory of the school’s founder, Dr. Joseph Krauskopf, whose will gave his personal library to the school. To house these books, a replica of his home library and office was added to the building. In 1969, to accommodate the expanded curriculum, the Samuel Cooke and the Harry Shapiro wings were added to the building. The Cooke Wing now is home to the Library's group study. The Shapiro Wing offers quiet study space and leisure reading. The Lower Level, beneath the Cooke Wing, houses the majority of the Library's print colleciton. In 1996, the Arthur and Rita Poley Gallery was established in the building. Following the death of her husband, Rita Poley donated funds allowing the Memorial Room to become a gallery space of the college's history. The Library has always been at the forefront of technology on campus, with one of the first websites for the college in the late 1990s. Our first online catalog and circulating system was installed in 1998, moving away from the card catalog. In 2017, the Library was an early adopter of Open Athens, a federated authentication system which allows students to seamlessly access Library and other DelVal resources. << Previous: ...use campus technology?